(1) Using a vacuum pump, apply a vacuum of 60 kPa (450 mmHg, 17.7 in.Hg) or higher to the diaphragm chamber. Wait for 1 minute and check that the needle of the vacuum pump does not lower. 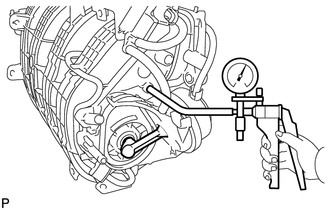 If the result is not as specified, replace the intake manifold. 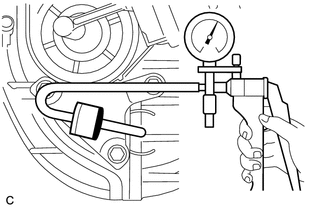 (b) After applying vacuum in the step above, check that the actuator rod operates. (a) Disconnect the vacuum hose from the check valve. 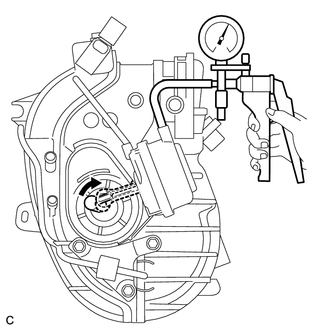 (b) Using a vacuum pump, apply vacuum to the check valve. Wait for 1 minute and check that the needle of the vacuum pump does not lower. If the result is not as specified, replace the check valve. (c) Connect the vacuum hose to the check valve. (d) Using a vacuum pump, apply a vacuum of 60 kPa (450 mmHg, 17.7 in.Hg) or higher to the vacuum tank. Wait for 1 minute and check that the needle of the vacuum pump does not lower.